PNG Prime Minister, Peter O’Neill has expressed appreciation for Australia’s support for Papua New Guinea’s hosting of the APEC process in 2018, and the understanding of the Australian Government in the action required in closing down the Manus Regional Processing Centre. PM O’Neill made the comments after meeting with his Australian Counterpart, Hon. Malcolm Turnbull MP, in Sydney yesterday, and the Australian Immigration Minister, Hon. Peter Dutton MP, on Monday this week. “Progress is being made to close the Manus Regional Processing Centre in compliance with the ruling of the Supreme Court, and all parties are committed to this process,” the Prime Minister said. “Further technical consultations will take place at the start of 2017 to move to the next level of this process. “Our co-operation on this policy has saved countless lives of children, women and men who would otherwise have attempted to cross the Indian Ocean in unsafe boats. “The trade human misery by people smugglers has ended. 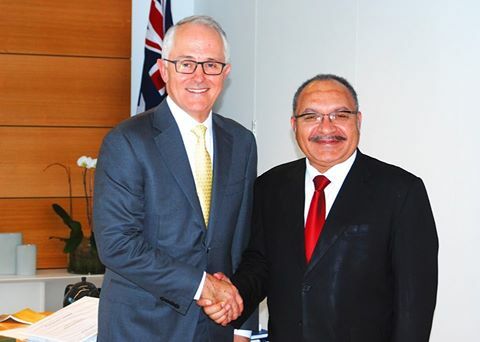 PM O’Neill further thanked the Australian Prime Minister for his Government’s ongoing support for Papua New Guinea in preparation for hosting APEC in 2018. “This is the first time that Papua New Guinea will host APEC, whereas Australia hosted the G20 Summit two years ago and APEC in 2007. “Australia has a wealth of experience and technical information that we are drawing from, and is further providing support and capacity building in areas that include security, logistics and policy development. “In particular, delivering the right level of security for the Leaders’ Summit, and all APEC meetings through 2018, is essential in successfully hosting APEC. “Papua New Guinea very much appreciates the commitment and the high level capacity building that we are receiving through the Australian Federal Police partnership. “AFP personnel are amongst the best in the world and are demonstrating their capabilities and we look forward to maintaining, or even expanding this program in support of APEC. “Papua New Guinea further appreciates support from the Australian Defence Force through training and the provision of equipment and personnel during APEC in 2018. Prime Minister O’Neill said he has invited Prime Minister Turnbull to come to Papua New Guinea in the New Year for an Official visit, and he hopes dates for the visit can be announced soon.